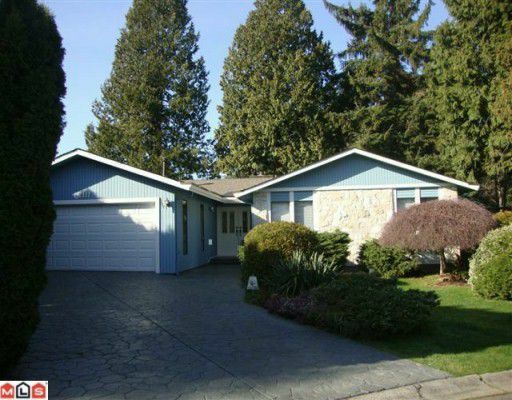 2317 COVE Place Surrey V4A 5L8 : Crescent Bch Ocean Pk. Harbourgreene cul-de-sac, rancher. Many mechanical updates: newer roof, hi-effic. furnace, heat pump/air conditioning, stamped concrete driveway, perimeter drain updated, exterior prof. repainted. Newer kitchen,golden maple, open to family room. The interior of this home is original, in good condition, but requires updating to current taste. MUST BE SOLD! Lots of big windows, sunken living room with vaulted ceiling. Huge unfinished storage/workshop area down. Cul-de-sac location within walking distance to the beach, on a very private west-exposed lot with bright patio and sundeck. Ocean Cliff Elem. catchment! Fabulous home structurally but requires a buyer with vision. Owner will consider all offers.